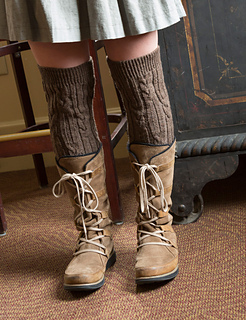 Covered in cables, these over-the-knee socks are worked from the cuff down with a traditional heel flap and stockinette stitch foot. The cabled leg is shaped by decreasing within the cable pattern. 12” circumference at knee, 7¾“ foot circumference, 9¾” foot length from back of heel to tip of toe (length is adjustable), 18½“ long from top of rib to top of heel flap. Note: The socks shown used almost all of two hanks. 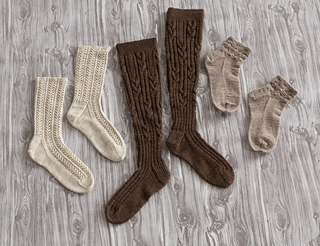 If making longer socks, plan to purchase additional yarn. Set of 4 double pointed needles (dpn) in sizes US 1 and 2 (2.25 and 2.75 mm) or size to obtain gauge. 40 sts and 39 rnds = 4” average gauge in patt from Charts A and B using larger needles; 27 sts and 37 rnds = 4” in St st using larger needles. Take time to save time, check your gauge. These stockings are designed to be worn over the knees. For shorter knee-high socks, cast on 108 stitches using the smaller needles, work in twisted rib for 1½“, then change to the larger needles and begin the cable pattern with Rnd 33 of Chart A. 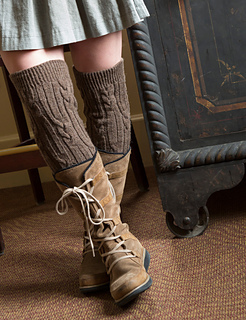 When Chart B has been completed, work the rest of the leg, heel, and foot as for the over-the-knee stockings.